Barkatullah University was once known as Bhopal University. Bhopal University was founded in the year 1970 and has been in continuous operation since then. In the year 1988, it changed its name to Barkatullah University in the memory of the great freedom fighter of Bhopal, Prof. Barkatullah. Barkatullah University (Bhopal University) campus is located on the main highway of the Jabalpur-Jaipur and covers an area of nearly 360 acres To extend its reach and to provide education to the unfortunate children’s who cannot afford a regular course, the university opened its Directorate of Distance education in the year 1974. Barkatullah University (Bhopal University) vision is to educate a maximum number of persons in their capabilities and educate them with the best possible knowledge and environment. Barkatullah University is up to date with modern facilities and other amenities to provide the best possible education for the students. The course material provided with distance courses is very easy to understand and help students to develop key skills required for the field. Distance education has become an important medium of studying in the recent times with the change in times. Nowadays, more and more students are undertaking distance education mode as their preferred choice of learning because it provides them with the option to work as they are studying. It enables them to support themselves while they are studying. Institute of Open and Distance Education, Barkatullah University, has opened various study centers to cater the needs of students. These study centers are made throughout the state to make them easily accessible to the student. Admissions are done on the basis of merit. 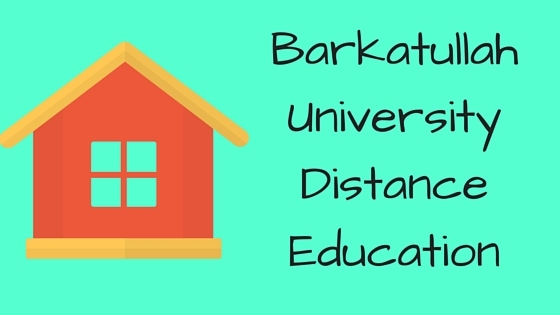 For applying, applicants must obtain prospectus and admission form from the directorate of distance education or they can download the form university’s website. Barkatullah University has now opened several study centers to make study easier for the students. The cost of application form is of Rs.210 and can be purchased from the main campus or can be downloaded from the university’s website and has to be sent with a DD favoring the Barkatullah University.